alaTest has collected and analyzed 8 reviews of Fusion Garage JooJoo. The average rating for this product is 1.7/5, compared to an average rating of 4.3/5 for other products in the same category for all reviews. Reviewers really like the size. The design is also mentioned favorably. There are some negative comments about the camera and battery. There are mixed comments on the touch screen and screen. We analyzed user and expert ratings, product age and more factors. Compared to other products in the same category the Fusion Garage JooJoo is awarded an overall alaScore™ of 76/100 = Good quality. Even if the Fusion Garage JooJoo gracefully executed its very limited capabilities, it would still be woefully overpriced. The fact that it has difficulty performing even basic tasks seals its sad fate. 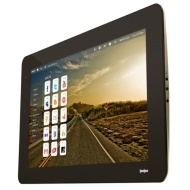 Large 12.1-inch 1,366-by-768-pixel touch screen. Browser supports Flash. No productivity apps, but you can use Google Docs for word processing and spreadsheet functions. Crashes often. Very buggy. Aside from Web browsing, doesn't do much else. Basic functionality requires future firmware updates. Touch screen is gesture-based; no multitouch (pinch and zoom) support. Can't use USB port or camera yet. Heavy.